By now, I'm sure you've all devoured a library or bookstore copy of Pride and Prejudice and Zombies. Who doesn't love a few Victorian ladies brandishing weapons and annihilating hordes of the undead? It is a daring story of family, marriage, independent women, and the walking dead. If you didn't get enough of Austen's feisty, monster-bashing heroines, Quirk Books will be releasing another literary "mash-up" in September. Ben H. Winters has re-vamped another Austen classic: Sense and Sensibility and Sea Monsters. 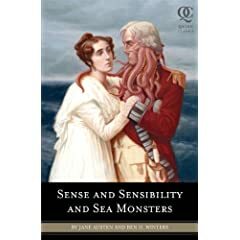 Although several comments have been made as to why Winters didn't go with Persuasion, since it takes place near the sea and involves Naval officers and other watery types, the success of Seth Graham's zombie-infested Austen novel should be an indication that Sense and Sensibility and Sea Monsters is sure to please fans of bizarre re-vamped classics (or fans of Lovecraftian mythos, such as myself). Winters says to expect, "A giant rampaging mutant lobster. Octopi with glittering tentacles. And pirates — I couldn’t resist pirates. I studied pirate lore, from R.L. Stevenson to Pirates of the Caribbean" (EW.com, 7.14.09). I don't know about anyone else, but this is just bizarre enough that I'll have to take a look when it comes out September 15th.